Three Layouts a Week – Can I Do It? About six weeks ago, Allison Davis (who also recently had a baby) challenged herself to do a layout a day. And with two small boys, she still managed to do so! As a regular reader of her blog, she has inspired me to do something similar, as well as create more two page layouts. (Her work is fabulous if you are not familiar with it.) I don’t think that with working full time and juggling several other commitments I can do a layout a day, but I am going to try to do three layouts a week. And, this blog (and all of you) are going to keep me accountable! Last night Matthew had a guys night and Elias ended up being pretty mellow, so I was able to do another layout with pictures from my trip to Wisconsin (sorry the scan isn’t the best- click on the layout to make it bigger). Again, I used Becky’s sketch book as a spring board for the layouts skeletal design. I am quite pleased with the result – especially because I used seven photos. It is a big trend in scrapbooking to just use one photo per layout. I know I am guilty of this. Now that my time is more limited and I am taking so many pictures of Elias, this is not practical! Becky’s sketches has been pushing me to use more photos on a layout than I otherwise would. 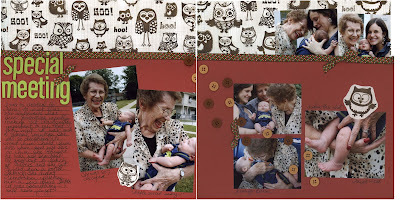 The owl paper is Sassafrass Lass – isn’t it adorable? When it came out last year (or early this year, I can’t remember) I HAD to have it. Since then, most of it has been sitting in my cropper hopper organizers waiting to be used. Photo Processing – What Site Do You Use? This week I started the process of uploading all my photos (since Elias was born) to Shutterfly. I have used Snapfish exclusively for about four years (before that I hopped around – Kodak Gallery, Snapfish, Shutterfly). However, I have recently discovered how much MORE Shutterfly has to offer than the other websites. Their photo books are amazing – especially their CK line. Be still my heart. Seriously, you must check it out. (If you want, email me and I will send you a link, and we will both get free prints!) You can create a website to share photos with family and friends, create awesome montages on any size print and so much more. Plus, if you need your photos quickly, you can pick them up at Target. Shutterfly’s photos are a few pennies more expensive than the other guys, but if you prepay, they are the same. With all the added features they offer though, I think it is totally worth it. I am excited to explore the site further and create our family share site. although i consider myself creative, i do not know the first thing about scrap booking. most of it looks really cheesy to me…your stuff does not. i love this page and the story you wrote about your grandmother. so sweet! i cannot imagine watching mine go through Alzheimers…it must be so hard to see. The Owl paper is so cute! I totally have to get some of that to do my 12 year old nephew’s birthday page from this summer. We had him and his brother for 2 weeks and he wanted to go to Hooters for his birthday supper and that owl paper is PERFECT! 🙂 Do you have an online store that you prefer more than the others? Ok, I must admit that I am a lazy scrapbooker. The only time I ever scrapbook is once a month at a crop and even then I spend most of the time talking and not really getting pages completed. I am going to go along with you and challenge myself to also scrap 3 pages per week. I have 3 children ages 6,4 and 3 and I work very part time but I think I can do it! I may have to scraplift some of your pages because you are just so talented, I love all of your work! Good luck on your challenge and thanks for allowing me to challenge myself! I used to use Shutterfly, but now I use ‘Picasa Web Albums’. I LOVE IT so much more than Shutterfly! And you can still order through Shutterfly too! 🙂 It allows you pick from a short list of print providers. You can look at it through the picture links on my blog. So sweet about your Nana! I, too, am an avid scrapper and it's funny, because this past Spring I was doing the 1/day layout thing. Lasted about 2 weeks. Life is just too busy!! But now I have a set-up where things are always out so it's easy for me to just go in and work a little whenever I get the chance, without having to spend time on set-up or clean-up. (Plus, it's protected from the kiddos!) Right now I would say I'm at about 2-3 layouts/week. I have a retreat in October, for which I'm psyched! And it's made it easier to be less productive at home since I know I'll have that time coming up. I am ashamed to admit that I have scraplifted a couple of your layouts already. They are just so cute!!! As for the photo thing, I haven't gotten into creative options offered by sites, so I just use Costco. The price is super-competitive, and they ship for FREE! They recently redid their site and now they actually offer pre-made scrapbook pages where you just drop in your photos. What a great idea for non-crafters who want to capture their stories, or a gift for a new mom. Also, I have to put in a plug for the Store & Spin Jr. from customcrops.com–LOVE IT! I use Shutterfly quite a bit. I, too, love their photo books. I also use Smugmug. Their print quality is amazing and they do odd/irregular sizes that are hard to find. The most amazing thing about Smugmug is that should your hard drive die, they will print you disks with every picture at a cut rate. I linked to your blog at a friend (in AZ) suggestion. I love it! I second what Everyday Thoughts said about Shutterfly printing the date the photo was taken on the back of the picture. This is truly invaluable. However,last I checked, they don’t do this if you elect to have them picked up at Target. Something else I appreciate is that your prints aren’t deleted after a certain period of time. I have pics on there from 2002 when my daughter was just a year or two old. And you can have them all backed up to CDs and sent to you just in case of a crash. I just realized today that the preprint plan is cheap as prints on Artscow and some other sites as well. If you aren’t in a hurry, you can get free shipping on Shutterfly too which can save quite a bit of cash! Found your site through goodle. I like to scrapbook but most of my friends like making cards and gifts more. I just joined a scrapbook club so I hope to make some pages at least once a month. I did make a couple of pages this week. Check out my blog to view them. Also, my husband has worked at southwest for the last 6 years. He likes his co-workers a lot but says the passengers have become a lot more difficult in the last couple of years. Like your site, will save to my favs…. That page is wonderful! The pictures are so sweet, especially the middle one with the huge grin on her face! That one captures such excitement! Jessica, have you ever tried Creative Memories digital books? They are amazing. Their Storybook digital scrapbooking software is so easy and the books are such good quality! I don’t care for their print from their photo processing site though. Love your layout! I have to say that after using a couple of different photo sharing/printing websites I landed with flickr, mostly because of their clean design. They are more geared towards sharing but they offer printing as well. They’ve also linked up with a bunch of third party organizations to offer some pretty cool products. Just my two cents. I am taking the challenge!! I am almost done with my 3 layouts for the week. Yahooo!! They’re simple layouts but I am getting the memories saved so that’s what counts. Girl you are so incredibly creative and you’re so BUSY and you a mom to a newborn! WOW you go girl! Thanks for being so inspirational!! jessica, i have been a lurker since angie posted on her blog about you having your baby. 🙂 i follow yours and matthews blogs pretty regularly. Have you checked out the Creative Memories storybooks. They are awesome for digital scrapbooking. I used to be a regular scrapbooker, but found the digital stuff to be much faster and easier. And I can do EVERYTHING digitally that I could do on paper. I love it. They also have a photo center that prints photos and other photo gifts. http://www.cmphotocenter.com is the site for photo gifts. the other site is creativememories.com Check it out!